Every popular Military caps, cafe caps and embroidered visors. Combine any style for quantity pricing! Brands such as Authentic pigment dyed, District Made, Sport Tek, Alternative Cap, Big Accessories and more! Embroidery your logo on these amazing visor, military caps and cafe caps. 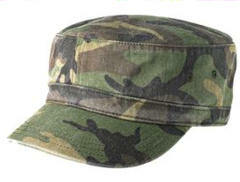 Distressed Military caps embroidered as well. 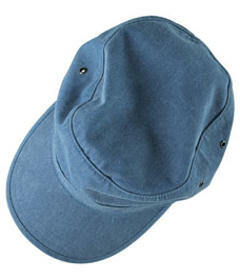 Popular custom embroidered 1918 Authentic Pigment Café Cap. 100% cotton twill; Pigment-dyed and garment-washed; Flat top stovepipe unstructured crown; Self-fabric taping on bill; Self-colored banded bottom, under visor, taping and sweatband; Grommeted side eyelets; Adjustable two-piece self-fabric Velcro® closure; Custom embroidery included. Logo size limitations on embroidery is 1.25 H X 4 W.
*You may combine all styles for quantity discounts. No need to drop and give us 20. 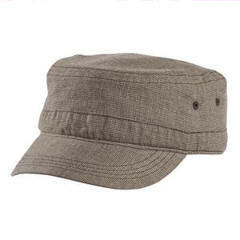 This laid-back 3-panel hat is enzyme washed and distressed to perfection. 100% cotton twill. Unstructured. Low profile. Hook and loop closure. Due to a special finishing process, distress and color may vary. Custom embroidery included. Custom embroidered AH76 Alternative Military Cap. 100% cotton chino twill; Unstructured; Enzyme-washed; Military style; Precurved bill; Velcro® closure; Custom embroidery included. Due to a special finishing process, distress and color may vary. Custom embroidery included. 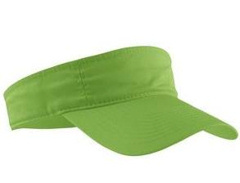 Fashionable custom embroidered Port & Company ® - Fashion Visor. CP45 . 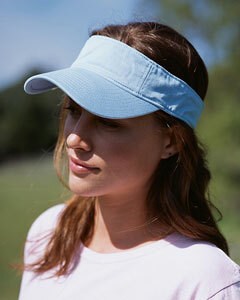 This budget-friendly 3-panel visor has a self-fabric sweatband that folds down for easy decoration access. The front panel measures 2.36"h x 6.1"w. 100% washed twill, velcro closure. Custom embroidery included. Sport-Tek ® - Dry ZoneT Colorblock Visor. STC13 with your custom embroidery. Sporty colorblocking joins Dry Zone moisture-wicking technology for a 5-panel visor that performs. The front panel measures 2.375"h x 7.25"w. 91/9 nylon cotton. Velcro® closure . Custom embroidered with your logo included! 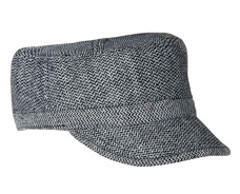 1915 Authentic Pigment Direct-Dyed Twill Visor with your custom embroidery. 100% cotton twill; 3-panel; two-piece Velcro® closure . Custom embroidered with your logo included!